Good Sunday morning! Kentucky plays for a trip to the Final Four in about 7ish hours, so I will be a wreck by then. Luckily, I am not now! 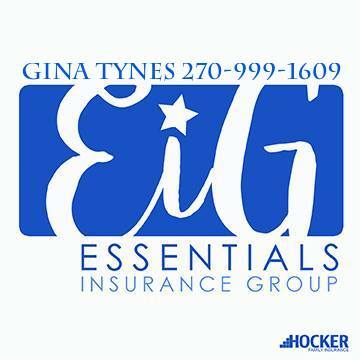 Its gonna get cold again across the region, so just go ahead an prepare. It is Already Cold out There! Yes, but it’ll get colder tonight. But, that is correct! 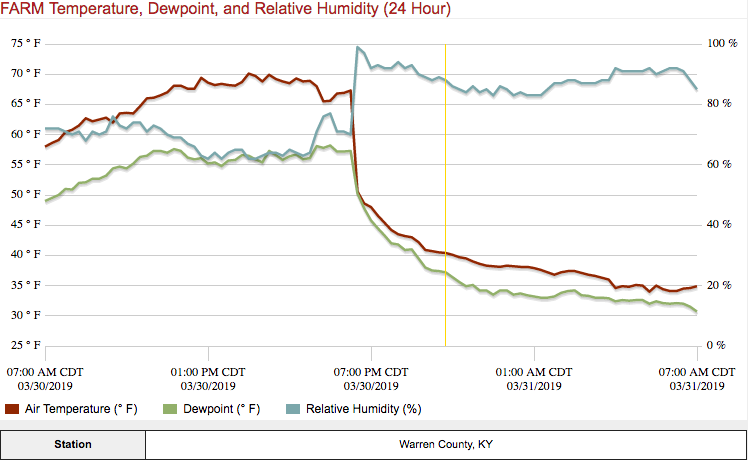 That cold front was fairly stout in Nature, and led to quite the temperature tumble almost immediately after it passed. We fell from 67ºF to 50ºF in 15 minutes. It was crazy! And here we are, sitting in the lower 30s region-wide. BUT, we are expecting widespread sunshine this afternoon, and that will help. I wouldn’t be surprised to see a cloud or two out there, but expect the sun for most of the day. Highs this afternoon are only expected to get up into the mid 40s, as northwesterly flow helps to keep it cool around here. 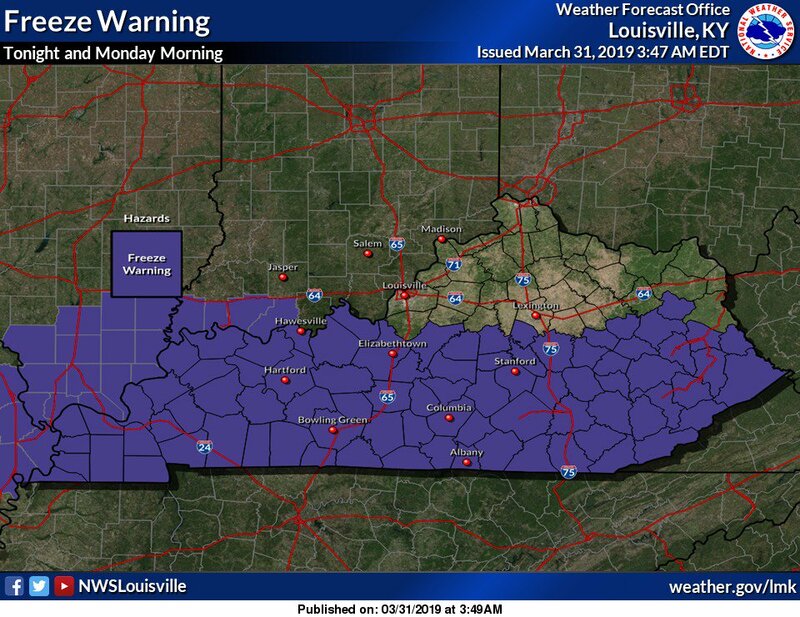 The NWS in Louisville has placed us under a Freeze Warning from 10 pm this evening until 9 am Sunday. This is due to mostly clear skies that are expected to develop overnight tonight. 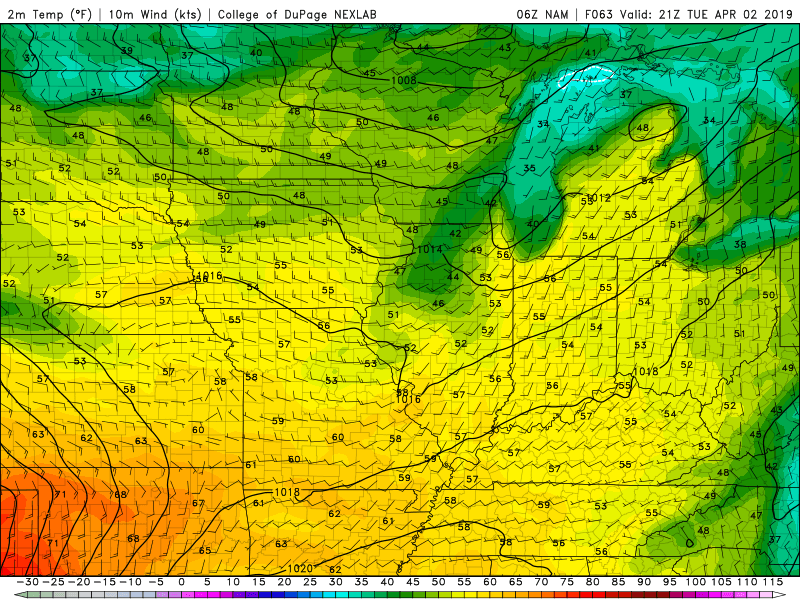 This, plus light winds, will be conducive to a hard freeze across the region! Lows are expected to fall into the upper 20s, so be sure to cover those plants up, and take a jacket to work! The rest of Monday looks pretty mundane. Expect high clouds to be a thing pretty much all day as a weather system gets its act together to our south. 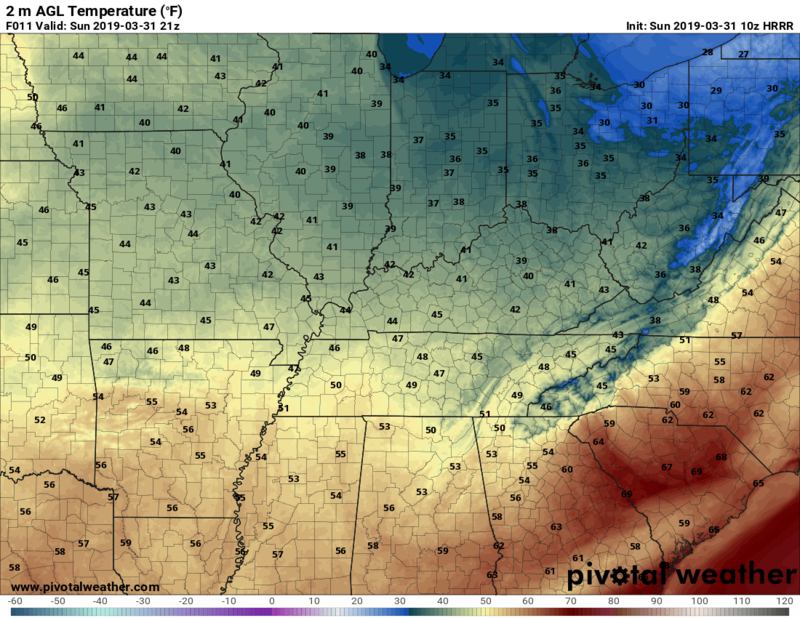 Highs Monday afternoon should be in the lower 50s, so not too bad! Frost is a possibility Monday night, but a hard freeze is not expected again. At what point do I stop calling regular jumps into the 60s and 70s “warm ups”? In theory they are, but at this point, they’re weekly and nothing too special. Anyways, the high pressure system that is giving us northerly flow is expected to sink to our south by Tuesday, increasing flow out of the south. We should see some cloud cover on Tuesday morning, but sunshine is expected to return Tuesday afternoon and bring us back into the 60s for highs! Beyond Tuesday, we get into the same ole pattern we have been in. Wednesday will likely feature increasing high clouds through the day, with highs in the mid to upper 60s. Our next rainmaker arrives on Thursday and will give us a shot at showers and thunderstorms through Friday. That is all I have folks! Have a fantastic day, and be sure to follow @wxornotBG on Twitter and Facebook for the latest info.